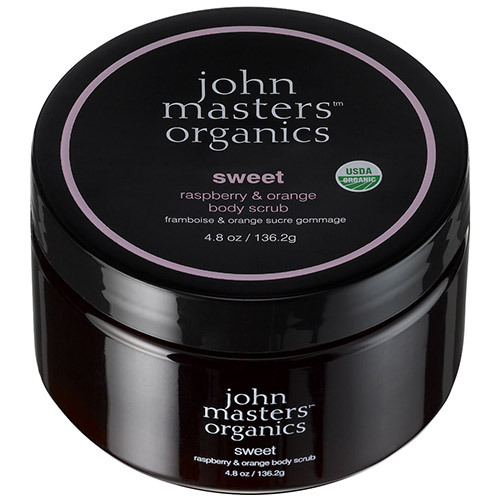 This sweet and sumptuous USDA certified-organic sugar scrub combines 15 organic oils and extracts to gently exfoliate and nourish the skin. Raspberry seed extract, high in antioxidants and omega-6 fatty acids, nourishes and tones, while Valencia orange oil helps brighten the skin and sweeten the senses. Geranium & ylang ylang oils hydrate and soothe sensitive skin. Sugar*, helianthus annuus (sunflower) seed oil*, cocos nucifera (coconut) sugar*, cocos nucifera (coconut) nut oil*, butyrospermum parkii (shea) nut butter*, rubus idaeus (raspberry) seed extract*, citrus sinensis (orange) peel oil*, rosa damascena (rose) flower oil*, cananga odorata (ylang ylang) flower oil*, pelargonium graveolens (geranium) leaf/flower oil*, lavandula angustifolia (lavender) flower oil*, lavandula hybridia (lavandin) flower oil*, citrus aurantium amara (neroli) flower oil*, salvia sclarea (clary sage) flower/leaf oil*, rosmarinus officinalis (rosemary) leaf extract*. Massage gently, polishing away dull skin cells. Rinse well and pat dry. Below are reviews of Body Scrub - Sweet - Raspberry & Orange - 136g by bodykind customers. If you have tried this product we'd love to hear what you think so please leave a review.